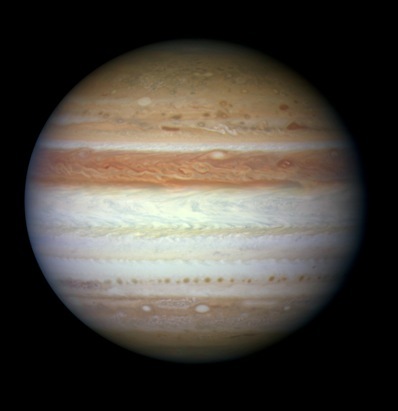 Amateur observations of Jupiter are of vital importance to professional astronomers working to figure out the mysteries of the Jovian atmosphere, says Dr Leigh Fletcher of the University of Oxford, who gave a presentation about recent activity on the giant planet at the Exoclimes conference in Exeter this week. Jupiter without its south equatorial belt, as seen by the Hubble Space Telescope this July. Image: NASA/ESA/M H Wong (UC Berkeley)/H Hammel (SSI)/ A Simon�Miller (GSFC)/Jupiter Impact Science Team. Fletcher’s comments come off the back of recent observations by amateurs such as Australia’s Anthony Wesley and Christopher Go from the Philippines, who have discovered asteroids impacts into Jupiter’s atmosphere and also chronicled the absence of the South Equatorial Belt. Indeed, says Fletcher, the image resolution of some amateurs’ work is comparable with the quality produced during the early days of the Hubble Space Telescope. One such aspect of the gas giant which Fletcher highlighted was the physical appearance of Jupiter, in regards to the disappearance of the South Equatorial Belt. This particular belt, one of several which cross the surface parallel to the equator, has been reported by scientists to have disappeared at irregular intervals. Previously, the belt has been observed to have vanished from the face of the planet in the 1970s, late 1980s and early 1990s and now more recently, this spring, while it was behind our Sun. But what explanation can astronomers find for this odd behaviour? The answer, according to Fletcher, lays in the turbulent activity in the depths of Jupiter; namely north-west of the Great Red Spot. This turbulence decreases and, at the same time, is accompanied by cooling from adiabatic expansion of rising air ‘kicking up’ ammonia ice crystal clouds from deeper within the atmosphere, thus obscuring the South Equatorial Belt and leaving the planet partially belt-less. Of course, the giant has not been forever devoid of its southerly feature, as the belt has revived itself following the previous times that it has played hide and seek with its observers. However, currently, the belt has not appeared after it faded this year. “Amateurs and professionals alike are waiting for a disturbance that signifies a revival,” states Fletcher. Historically this could be in the next two years, amidst a dramatic outburst of storms and vortices which are characteristic of the atmosphere of the fifth planet from the Sun. “We’ve really only scratched the surface of what is driving the physics and chemistry of the atmosphere,” adds Fletcher.